If you watched the game last night then you know that Orlando let the game and probably the series run down their collective legs last night. I am not sure I've ever been as frustrated about a basketball game before. Make your free throws and you win the game. Foul Derrick Fisher and you probably win the game. It's one thing to just get beat like it game 1, but in games 2 & 4 you had opportunities to win. Oh well enough about that, we'll just have to wait until Sunday to see what happens. 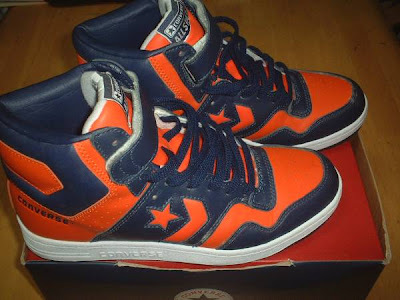 For those of you with an eye for all things Converse, you might have seen a version of this shoe recently. The original Converse Starion was a basketball shoe from the 80's, but today's flashback is of the Japan Re-issue from a few years ago. One of the great things about these shoes is how the design lends itself to some outstanding colorways. 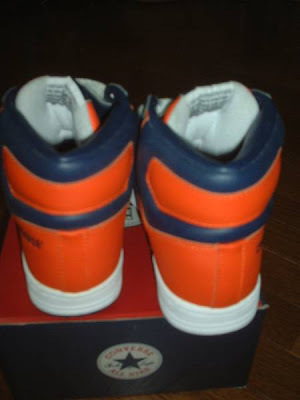 For example the shoe I have today is in a Orange/Navy colorway. I also really enjoy the ankle strap which personally I can never get enough of. Converse Japan has continued to release different colorways of this shoe over the years so you might find some other colorways floating around in the world wide interweb. As soon as I publish this post I am going to put up the poll so check back in a few minutes and vote! Ya man me too i've had this pair in a red white and blue colourway since 2004 and i haven't thrown them out since. Comfortable enough. 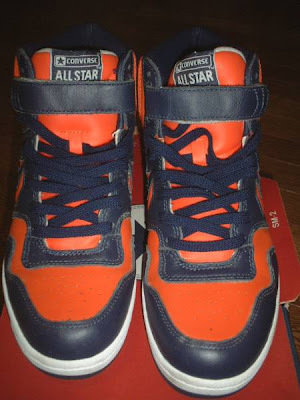 if anybody can email me on how to obtain another pair of these that will be amazing. ak7-11_chronic@hotmail.com. Cheers.